We're not sure where the name Prague comes from till now. The oldest records say that there was no Prague, only a town called „Mezigrady“. This name says everything the about location of urban settlement between two castles. The name „Praha“, actually „Fraga“ comes from 10th century. It appeared in one Arabian merchant's documents. There are many other legends and theories about the name Praha, but the most probable is this one. It says, that Prague was built on non-overgrown and parched slate - „na Prazě“. So the name was taken from the city's subsoil. People had already lived in Basin of Prague already in the stone age, but we can't speak about a true settlement up to the 6th century. Princess Libuše predicted the future glory of Prague, which would touch the stars. In the 6th century, Slavs came to the Prague valley. In the 9th century, prince Bořivoj founded a castle above the Vltava valley and in the 10th century, Vyšehrad castle was built. The Old Town was built around several market places between Vyšehrad and a meander of Vltava under Letná. They merged into a town in the 13th century under Václav I. Significiant places, which we can find in the Old Town are Charles Street, Charle Bridge, Old Town Square. Prague became a centre of European significance during the rule of the king Charles IV. He established Charles University in 1348 and the New Town. He promoted the construction of Charles Bridge. In the last quarter of 14th century, the Old Town bridge tower with a gate, which leads to Charles Bridge, was built. It is the most wonderful tower in the whole Europe. Petr Parléř led that constuction. There is a famed astronomical clock on the south side of the tower. That is a work of Mr. Hanuš, whom they got blind, to never build anything else again. Prague was a centre of Hussite movement in the 15th century and it was a cosmopolitan centre then. Prague was also the seat of Rudolph II, who invited some popular artists and scientists to Prague in the 16th and beginning of 17th century. At the end of the 18th century Czech scholars and authors began the process of national revival in here. Czechoslovakia became independent after the 1st world war in 1918. In 1939 Prague was occupied by German troops. On 9th May, 1945 (it was after the Prague Uprising) the town was liberated by the Russians. The year 1960 marked the beginnig of The Czechoslovakia Socialist Republic. It seemed that the train of torment finally arrived to the last station, but it wasn't to be. Tanks of Red Army reached Prague in 1968. It caused so many people's outraged reactions even so much, that Jan Palach burned himself. That stopped democratic reforms and began the proces of „normalization“. On 17th November 1989, the Velvet Revolution began democratic changes in our society. On the 1st January 1993 Prague became the capital of the Czech Republic. Prague is in the heart of the Czech Republic as well as the Czech Republic is the heart of Europe. It lies on the both banks of the Vltava River. Prague is situated in indented area of Prague basin and promontories of Central Bohemia downs which surround Prague. Prague has an area of almost 500km2. It has about 50km from the east to the west and 30km from the north to the south. The terrain of Prague is complicated. The area of the Prague basin is splited by Vltava valley and its inflows. The historical centre of Prague lies in the Vltava valley and on surrounding hills. There are some parts of border areas of Prague lying even as high as 200m above the Vltava level. So that's a real difference. The centre of Prague is densely built-up and it has miniumum of parks and empty ground. There is less housing density further from the centre. Borders of Prague are lined by huge blocks of flats. There are more nature, woods and reservations in the border parts of Prague. There’s Vladislav Hall, where elections of president take place. There’s St.Vitus Cathedral, which was completed in 1929 by two famous architects - Matyáš of Aras and Petr Parléř. In the cathedral, there’s gothic St.Wenceslav Chapel, the coronations jewels - they are St. Václav's crown, the Sceptre and the Orb. The cathedral had been built from the gothic era up to 20th century and it's amazing, that in the lower parts of the cathedral there are roughly worked blocks of stone and the ceiling is made of concrete. Then we should visit Charles Bridge. Charles IV founded it in 1357 but it was finished by Petr Parléř in 1402. It’s decorated with 30 sculptures - mainly of Baroque origin. Charles Bridge is the tourist attraction, a place for walks, it’s a market in the open air; there’re some artists, they sing and draw the pictures. From Charles Bridge, we can get to Old Town Square, the centre of Old Town. In the centre of the Square, there’s a monument of the great reformer John Huss, whose ideas inspired the Hussite Revolution in the first half of the 15th century. We can visit Bethlehem chapel, where John Huss preached. It was founded in 1391 and it was changed from the Jesuit to a catholic church in 1661. There’re also the Old Town Hall and the calendarium. The calendarium is from the early 15th century. The 12 apostles appear every hour in the top part of the calendarium. Then we can stop for have a look on the Powder Tower. The Powder Tower was established in 1475. 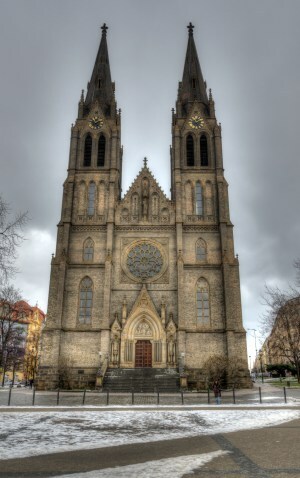 In the last century, it was rebuilded in neo-gothic style. At the end of 17th century, it was used for storage of gunpowder, that’s why it’s called the Powder Tower. Václavské náměstí is 750m long - it's the longest square in the Czech Republic. There’re a lot of banks, restaurants, hotels, shops, cinemas, and boutiques. At the top, there’re St.Václav's bronze statue and National Museum. There’re expositions of history, precious stones, evolution of people and evolution of Earth. Technical Museum is my favourite, there’re exhibitions of mining, car industry, motorcycles, trains and planes. It lies on Letná. The highest of seven hills, among which Prague was built, is called Petřín. There is a 60m high lookout tower on the top. There is also a funicular, which can get you onto the top of the hill in 5 minutes, so you'll be fresh for other sights for example Vyšehrad. Vyšehrad was founded as a prince fort in 10th century and also the Czech coinage was minted in here. It was rebuilt many times and in Vyšehrad graveyard there are preserved the most significiant Czechs for example: Karel Čapek, Antonín Dvořák, Jan Neruda, Božena Němcová, Bedřich Smetana. Prague is the biggest traffic point crossway of our country. 5 motorways of European meaning and 5 railroads of international meaning converge there. Vaclav Havel international airport serves 4 million people every year. There is a dense and high-quality net of public transport with underground (almost 50km), but the river basically isn't used for public traffic. Underground has transported 400 million people in 1997. That's 38% of the whole public transport in Prague.